OBJETIVE: To present an overview of micronutrient status of Mexican children in 2006. MATERIALS AND METHODS: Data on iron, zinc, folate and vitamin B12 deficiencies and low serum copper and magnesium were gathered and critically analyzed from the 2006 National Health and Nutrition Survey. RESULTS: Iron deficiency is still the main nutritional deficiency in children (13%-26%). Zinc deficiency was high in all age groups (≈25%) but reduced 5.6 PP in children <5 y from 1999 to 2006. Folate deficiency was 3.2% and vitamin B12 deficiency 7.7% in children. Low serum magnesium and copper were high (22.6% and 30.6%, respectively). CONCLUSIONS: The prevalence of iron deficiency seems to be lowering, and zinc deficiency has reduced in Mexican children. A high prevalence of copper and magnesium deficiencies warrants further research on their public health implications. OBJETIVO: Presentar un panorama del estado de micronutrimentos de niños mexicanos en 2006. MATERIAL Y MÉTODOS: Los datos sobre deficiencias de hierro, zinc, folatos, vitamina B12 y concentraciones bajas de cobre y magnesio se analizaron a partir de la Encuesta Nacional de Salud y Nutrición 2006. RESULTADOS: La deficiencia de hierro fue la más importante en niños (13-26%). La deficiencia de zinc fue alta en todos los grupos de edad (≈25%) y disminuyó entre 1999 y 2006 5.6 pp en niños. La deficiencia de folatos fue de 3.2% y la de vitamina B12 de 7.7%. Las concentraciones bajas de magnesio y cobre fueron altas (22.6 y 30.6%, respectivamente). CONCLUSIONES: La deficiencia de hierro pareció disminuir y la de zinc se redujo en niños mexicanos. La alta prevalencia de deficiencias de cobre y magnesio merecen más investigación para entender sus implicaciones en salud pública. In 2006 a new national nutrition survey was carried out: the National Health and Nutrition Survey (Encuesta Nacional de Salud y Nutrición 2006, ENSANUT 2006).5 Blood samples were obtained for analysis of micronutrient status and stored while funds were obtained for laboratory analyses. This paper presents an overview of the micronutrient status of Mexican children and adolescents in 2006, addresses the determinant factors of the different micronutrient deficiencies presented in related articles in this issue of Salud Pública de México (SPM) and highlights the most relevant findings. It also discusses differences in the micronutrient status indicators measured in 1999 and 2006 which were comparable. The results and conclusion of the paper can be used as input for designing public policies and as a reliable source of information for the health and academic community. Data collection methods for assessing micronutrient status in children 1-11 y (n=5 060) and adolescents 12-19 y (n=2 418) are presented in detail in several articles in this issue for microminerals7,9 and vitamins.8 The present analysis is based on the information furnished by those articles. The protocol of the survey was approved by the Research, Ethics and Biosecurity Committees of the National Institute of Public Health, Cuernavaca, Mexico. Table I presents the indicators of micronutrients status and the cut off values defining the deficiencies (or low serum concentrations) of individual micronutrients used in 2006. It also presents the methods used in 1999 to show that methods of assessment or cut-off points used to determine all micronutrients status differed between surveys, precluding comparisons. Only anemia and zinc were determined using the same method and cut-off values in both surveys. Statistical analyses are described in detail in articles in this issue.7,8,9 Several of the analyses are presented and discussed in the context of geographic region and/or rural and urban areas (as previously described), age group, and SES classification. Data were analyzed with Stata 9.2 package. Results are presented for 5 060 children 1-11 y and 2 418 adolescents 12-19 y. The prevalence of iron deficiency, as assessed by serum concentrations of soluble transferrin receptors (sTfR >6 mg/l), was 15.7% in children <5 y and 7.9% in children aged 5-11 y. No differences were noted between urban and rural areas. The prevalence, as assessed by serum ferritin <12 ug/l, was 26.0% in children <5 y and 13.0% in children 5-11 y. Prevalence in children 1-11 y was higher in rural areas (table II). 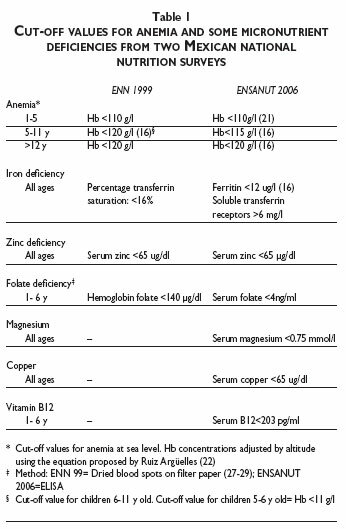 The prevalence of zinc deficiency in 2006 as assessed by serum zinc <65 µg/dl10 was 27.5% in children under 5 y and 23.6% in 5-11 y old children (table II). The prevalence of low serum zinc levels back in the 1999 National Nutrition Survey was 33.1% in children under 5 years of age.3 Reductions of 5.6 percentage points (PP) were observed from 1999 to 2006. The prevalence of folate deficiency as assessed by serum folate<4 ng/ml was 3.2% in children 1-5 y. Determinations were not made in older children. The prevalence was slightly higher in urban than in rural areas (table II). This issue of SPM reports for the first time the nutritional status of magnesium, copper, and vitamin B12 in a probabilistic, population based sample in Mexican children and adolescents.7,9 The prevalence of low magnesium serum concentrations (<0.75 mmol/l) was 22.6% in children 1-11 y and 37% in adolescents (12-19 y). Prevalence was higher in urban areas in children 1-11y (25.8%) compared to rural areas (18.6%) and were similar in adolescents. Prevalence of low copper serum concentrations (<65 ug/dl) was 30.6% in children 1-11 y and 14.1% in adolescents. Prevalences in children and adolescents were similar in urban and rural areas (table III). 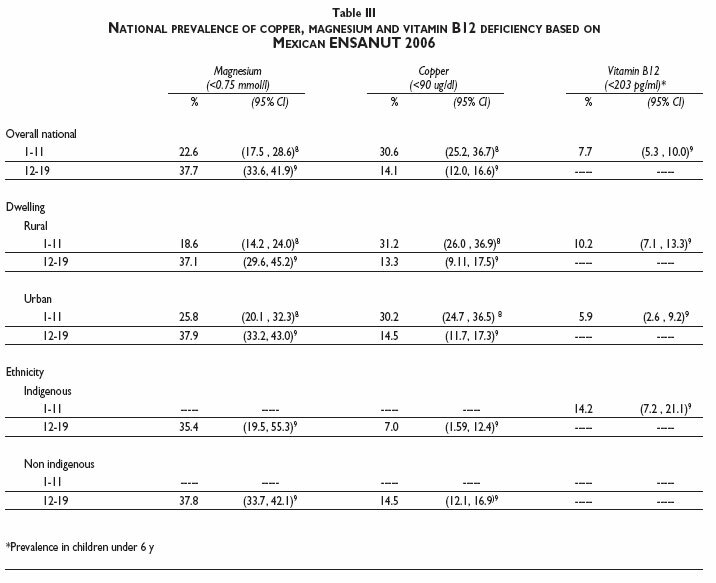 One of the papers in this issue analyzed the prevalence of low copper serum concentrations by ethnic background (indigenous vs. non-indigenous) in adolescents,9 finding that the prevalence in non-indigenous population was about twice the prevalence in indigenous children (table III). Prevalence of vitamin B12 deficiency (serum B12<203 pg/ml) was 7.7% in children 1-5 y. Prevalence was higher in rural compared to urban areas (table III). The prevalence of anemia in children and adult population in 1999 and 2006 were thoroughly analyzed in two recent publications,11,12 thus this section will be limited to the analysis of the causes of anemia in children <5 years of age. In 2006, the proportion of cases of anemia documenting iron deficiency irrespectively of the presence or absence of other deficiencies was 42%. The proportion of cases of anemia associated with iron deficiency combined with deficiencies of folate and/or vitamin B12 was 10.3%. The proportion of cases of anemia associated with deficiencies of folate or vitamin B12 without iron deficiency was 2.0%. The proportion of cases of anemia of non-identified nutritional cause was 45% (table IV). It is important to underline that serum concentrations of vitamin A were not determined in the 2006 survey. A remarkable finding is the reduction (about 20%)in the prevalence of zinc deficiency in children <5 y from 1999 to 2006. Public programs supplying children and pregnant and lactating women with fortified food and supplements containing zinc, among other micronutrients, serve almost 5 million beneficiaries (Liconsa) and more than 5 million families (Oportunidades). Therefore, it is likely that these programs have contributed to improve the zinc status of those age segments. The efficacy of the supplement distributed by Oportunidades was tested in urban children younger than 3 years, finding that it was as effective as the powdered micronutrients preparation known as "sprinkles" to reduce the prevalence of zinc deficiency (from 10 to 30 PP) after 4 months of consumption.14 In spite of such a reduction, the prevalence of zinc deficiency persists at high level. This may be explained in part by the high dietary intake of inhibitors of intestinal absorption of dietary zinc, such as phytates, calcium, and fiber. The molar ratio phytate to zinc in the Mexican diet is about 6:1.15,16 Therefore, it is mandatory to carry out studies focused on the effectiveness of the micronutrient fortified foods or supplements provided by the public food assistance programs to reduce the prevalence of zinc deficiency. Low serum magnesium might be very relevant for the epidemiological and health status of the Mexican population, because it has been associated with glucose intolerance and higher risks for atherosclerosis, hypertension and myocardial infarction.21-23 More research is needed in order to explore the consequences of magnesium deficiency in the health of Mexican population. 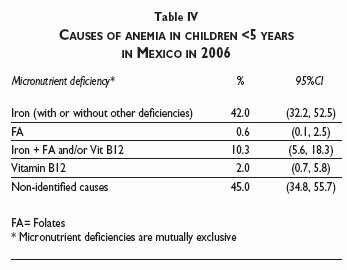 Anemia in Mexican children younger than 5 y was associated with iron deficiency in less than half of the cases analyzed in the two surveys, 199924 and 2006, highlighting the causal importance of other micronutrient deficiencies. In conclusion the prevalence of iron deficiency, although still high, seems to be progressively lowering in children. The prevalence of zinc deficiency in children < 5 y had some improvements that may be associated, in part, with public and focalized nutrition interventions aiming to curb it. The high prevalence of copper and magnesium deficiencies warrant further research to better understand their implications for public health. These results provide relevant information to reinforce some of the ongoing nutrition policies and to redesign others, particularly referring to zinc, copper and magnesium deficiencies. Av. Universidad 655, col. Santa María Ahuacatitlán. Declaration of conflict of interests: The authors declare that they have no conflict of interests.